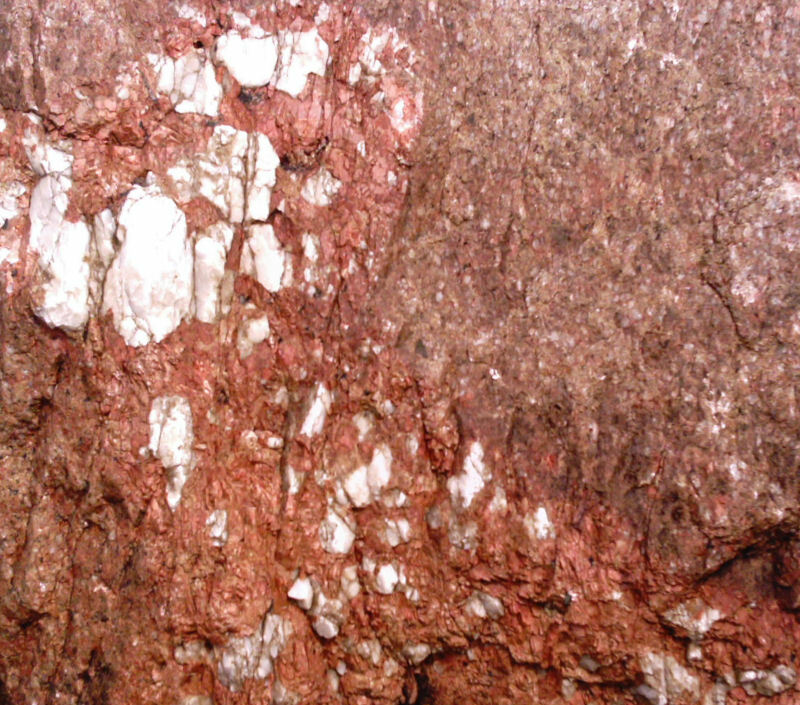 Pegmatite. (Gk. Pegma = framework, from Pegnunai = to fasten + lithos = rock). Pegmatites are very coarsely crystalline, often light coloured igneous rocks with crystals ranging in length from 2.5cm to > 1m. They are mainly of granitic composition. They are formed at a late stage of crystallisation when the magma is rich in volatile elements which may be transported by pneumatolytic (gaseous) and hydrothermal (hot water) fluids (Allaby & Allaby, 1990, p. 402). It is thought that the larger, slowly forming crystals can trap minerals such as tourmaline, cassiterite, rarer elements such as lithium, boron and fluorine, and rare earth elements for example, europium. There are also pegmatitic gabbros and syenites. 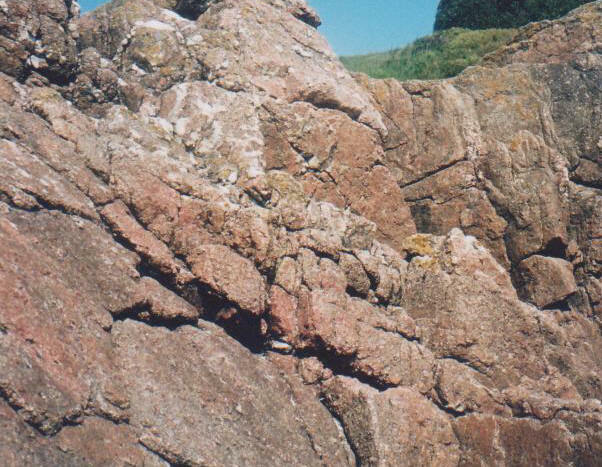 In Jersey, pegmatites occur in the main granite masses as isolated patches of various sizes, from several centimetres to c.1m. They are well exposed in both the Southwest and Southeast Igneous Complexes and stand out as areas of large pink-red orthoclase feldspar crystals interlocked with large, milky white quartz crystals against the red background of the host granite (Nichols & Hill, 2004, pp. 63 & 65). Quartz pegmatite patches and pipe structure, La Rocque jetty outcrops. 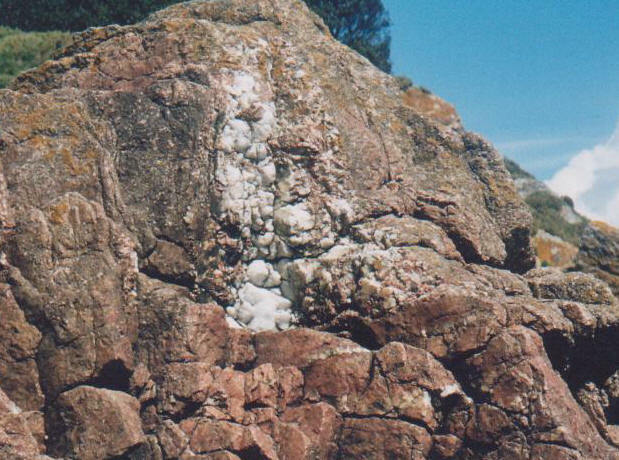 At La Rocque Point in the Southeast Igneous Complex southwards onto the wave-cut platform, large patches of pegmatite occur with fine examples of positive and negative crystal outlines where the corresponding quartz or orthoclase crystals have been eroded. Certain of the coarse gabbro-diorites in the same complex may also be considered pegmatites. Nichols, R. A. H. and Hill, A. E. 2004. Jersey Geology Trail. Private publication printed by The Charlesworth Group.